Some of the hymns for Vespers of the Transfiguration in the Byzantine Rite. Before Thy Cross, o Lord, the mountain imitated heaven, the cloud was spread out like a tent. As Thou wert transfigured, and born witness to by the Father, Peter was present with James and John, since they were also to be with Thee at the time of Thy betrayal, that seeing Thy wondrous deeds, they might not be afraid at Thy sufferings; which deem us worthy to adore in peace, for the sake of Thy great mercy. 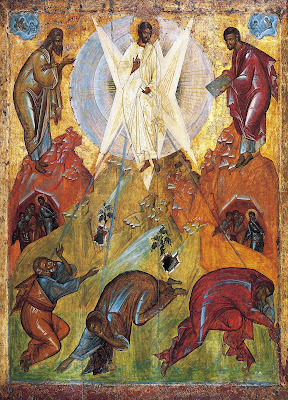 Icon of the Transfiguration, attributed to Theophanes the Greek (called ‘Feofan’ in Russian), the teacher of the famous iconographer Andrei Rubliev; early 15th century. Originally painted for the Cathedral of the Transfiguration in Pereslavl, now in the Tretyakov Gallery in Moscow. Before Thy Cross, o Lord, taking Thy disciples unto the high mountain, Thou wast transfigured before them, shining upon them with rays of power, on the one side, in Thy love of mankind, on the other, in Thy might, wishing to show the glory of the Resurrection; of which deem us worthy in peace, as one merciful and loving of mankind. When Thou wast transfigured on a high mountain, O Savior, having with Thee Thy chief Disciples, Thou didst shine forth in glory, showing that they who are preeminent in the sublimity of virtue, shall also be made worthy of divine glory. And Moses and Elijah, speaking with Christ, made manifest that He is the Lord of the living and the dead, and that He was the God Who spoke of old through the law and the Prophets, to Whom also the voice of the Father did bear witness from a radiant cloud, saying, “Hear ye Him, Who by the Cross hath despoiled Hades, and bestowed eternal life upon the dead. The mountain which once was dark with smoke is honorable and holy, upon which stood Thy feet, O Lord, for the mystery hidden before the ages, at the last Thy awful Transfiguration did manifest to Peter, James and John; who, unable to bear the radiance of Thy face and the splendor of Thy raiment, were borne down upon their faces in the ground, and being overcome with astonishment, wondered as they saw Moses and Elijah speaking with Thee of the things that were to befall Thee. And a voice from the Father bore witness, saying, This is My beloved Son in Whom I am well pleased; hear ye, Him Who granteth to the world great mercy.